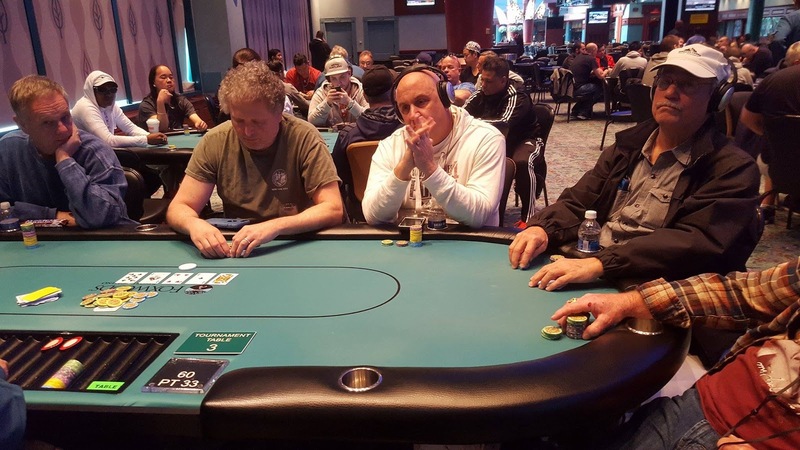 There were a total of 82 entries in the final flight of the Foxwoods Mega Stacks Championship event. At the moment, there are 50 players remaining. These players will play three more levels before bagging and tagging for the night. And survivors at the end of the night will then join the 30 players that bagged up in Flight A, and will return tomorrow (Fri. May 12th) to play Day 2 at noon. 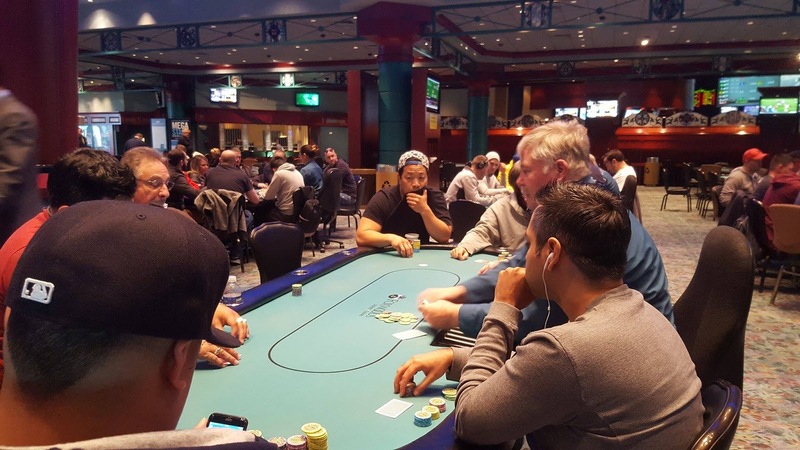 At the conclusion of 12 levels of play, and 87 total entries, 30 players are advancing to Day 2 from Flight A of the $1,650 Main Event. David Grandieri ended the evening as the Flight A chip leader, with 243,500. Grandieri was the only player to cross over the 200k chip mark. He held a strong lead on the field for a large part of the day, and then really pushed ahead of the pack in the last level when he flopped a flush to send one of his opponents home. He brushed the 300k chip mark at the end of the last level, but then doubled another player up and lost 60,000 in one of the very last hands of the night. His 243,500 chip stack is still far ahead of the second and third place stacks belonging to Konstantinos Mitsopoulos (171,200), and later registrant Johanssy Joseph (165,000). Joseph bought in just after the second break and consistently ran up his stack through the last six levels of play. The 30 players listed below all earned a night off, and are able to rest up before the start of Day 2 tomorrow (Friday May 12th) at noon Eastern time. Any player that did not make it through in the first flight has a second chance in Flight B, currently running on the other side of the tournament room. Flight B registration is open until approx. 11:30pm. Main Event, Flight A - David Grandieri Increases Chip Lead "In Real Life"
There are four players to see the A♥Q♥5♥ flop. Michael Clemente checks in the small blind, a player in middle position shoves all in for 24,200, Philip Chin calls the 24,200 in middle position, and David Grandieri moves forward a stack totaling around 100,000, essentially putting all other players all in. Clemente pauses for over a full minute, then releases his cards, and Chin also mucks. "Is this even real life?" Grandieri says aloud. "Did you have the king of hearts?" a player asks Clemente about his tank. "No, I honestly forgot I had cards, was just thinking about the last hand," Clemente responded seriously, causing a few players at the table to giggle. "Do you have ace queen?" the player that is all in, asks Grandieri. "No, I have a flush," Grandieri responds as he turns over 10♥7♥. The player then turns over A♣ J♦ for a pair of aces. The 6♣ turn leaves the player drawing dead, and the 4♠ river is inconsequential. After the hand concludes, and the player has walked away, a few players at the table continue to discuss and giggle about the various odd moments that occurred during the hand. There were a total of 87 entries in the first of two starting flights in the Foxwoods Mega Stacks Championship event. At the moment, there are 45 players remaining. These players will play two more levels before bagging and tagging for the night. They will then join any players that bag in this evening's Flight B, and will return tomorrow (Fri. May 12th) at noon to play Day 2. Any player eliminated from Flight A still has a second chance to play in Flight B, with registration open until around 11:30pm. A player on the button opens to 2,000, and Jeffrey Yanchek raises to 6,700 in the small blind. Sam Taylor pauses in the big blind, before shoving all in for around 35,000. With actin back on the button, he shoves for slightly less, and Yanchek goes into the tank. Yanchek places his hands on his forehead, leans over the table, and after a minute passes by, hesitantly releases his cards into the muck. Taylor shows A♠Q♦, and the button shows 7♣6♣. Yanchek is visibly frustrated, saying, "Ah man." The board runs out 10♥5♥4♠A♣J♣ awarding Taylor the pot and eliminating his opponent from play. "Ace king?" Taylor asks Yanchek. "Yeah, I just thought with his re-shoving...," Yankchek says as his voice trails off. Ralph Macri has steadily increased his chip stack over the course of the day, and is now sitting with one of the largest stacks in Flight A. Just a few minutes ago, Macri called an opponent's shove holding Q♦Q♥ against his opponent's A♦K♣. The 9♠4♠3♠2♠3♥ board gave Macri's opponent a chance for a chop on the turn, but ultimately Macri's queens held, and the player was sent to the rail. After winning this pot, Macri has now crossed over the 100,000 chip mark. There are three people to see the A♠10♣7♥ flop. Je Wook Oh checks in the small blind, Philip Chin checks in the hijack, and the button checks as well. The turn is the 8♣. Oh checks, Chin bets 7,500, the button folds, and Oh calls. The river is the 6♥. Oh checks again, Chin shoves all in, having Oh covered, and Oh pauses to think. After a minute of looking at the board intensely, Oh tosses in a chip to call. Chin turns over 7♣7♦ for a set of sevens, and Oh mucks without show, as he stands up and prepares to exit the tournament area. The players have just returned from their second break of the day. They will play another three 40-minute levels before registration will close. As a reminder, any player that does not make it through in the first flight has a second chance this evening, as Flight B will begin at 5pm. The board reads Q♦J♥4♥. A player in earlier position checks, Eric Rivkin bets, and his opponent shoves all in for around 13,000. Rivkin quickly calls and says, "Three jacks," as he turns over J♠J♣. His opponent shows 4♦4♣ for a smaller set. The 5♠ turn does not change the hand, and the Q♥ river gives both players a full house, but awards the pot to Rivkin. There's around 25,000 in the middle, and the board reads A♠8♣4♥A♣. Dino Moustakis bets 5,000 in the big blind, and Daniel Monosson raises to 10,000 on the button. Moustakis calls. The river is the J♦. Moustakis checks, and Monosson bets 5,000. Moustakis quickly calls. Monosson turns over A♥4♠ for a full house, and Moustakis quickly mucks his cards. There is around 25,000 in the middle, and two players looking at the 8♠7♣2♣3♥10♦ board. The player in the cutoff shoves all in for around 11,500, and Solomon Yi goes into the tank. Nearly two minutes pass before Yi tosses in a chip to call. The cutoff shows K♣6♣ for a broken flush draw, and Yi turns over J♥J♦ for a pair of jacks to win the hand, and eliminate his opponent from play. While Yi was busy scooping a pot, at the neighboring table, Mike Azzaro also sent an opponent home. The player stood up, slammed the table, and quickly walked away from the table. The board read J♥6♣6♦K♥8♥, and Azzaro had 8♠6♠ sitting in front of him, good for a full house. The chatter at the table filled in the rest of the story. Apparently, Azzaro's opponent held X♥6♥, having also flopped trip sixes, and rivering the flush. But Azzaro hit the miracle card on the river to give him a full house to eliminate his opponent from play. There are four players to see the J♠6♠3♣ flop. 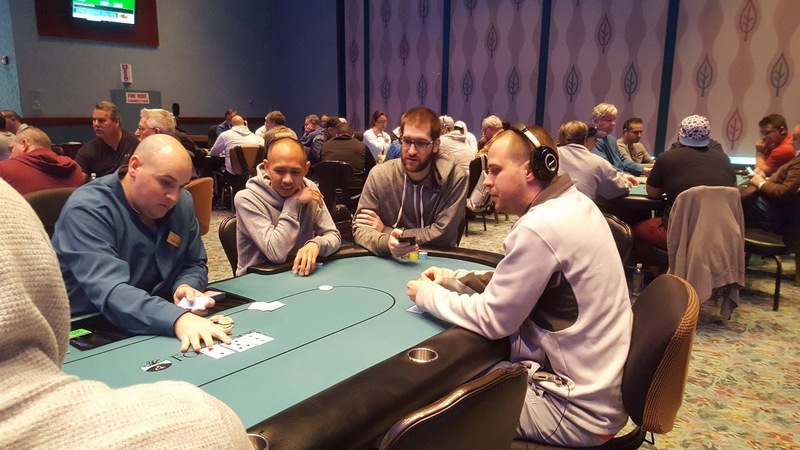 The small blind checks, Philip Chin bets 400 in the big blind, Michael Clemente calls in middle position, and Dmitri Pidvysotski calls in the cutoff. The small blind opts to fold. The turn is the 9♥. Chin bets 1,150, and Clemente shoves all in. Pidvysotski folds, and Chin asks for a count. Upon hearing the 3,000 total, Chin calls. Unfortunately for Clemente the 7♦ river does not improve his hand, and he is eliminated from play. "How bad do I run?" Clemente asks as he stands up and prepares to exit the tournament area. "Where was the raise preflop?" a player at the table asks. "I didn't want to raise, I only had 4k to start the hand," Clemente responded.